* Image Extraction. With this you can extract images (hero/skill/item) from the DotA map. * Data dump. This is useful when you want to view DotA map’s database (heroes, items and abilities). * Replay Parser. Opens replay files (*.w3g) and displays some information about the game: host, players, heroes, line-ups, chat-log, kill-log, skill/item order, wards and, if possible, kills/deaths/creeps/denies list. * Replay Parser/Replay Finder. A tool built in replay parser that allows searching for replays that contain specific players, heroes or both. * Fixed Item Combining Mode bug in 6.64 that was also causing replays not to parse when map cache is enabled. * Replay Parser: Optimized map cache storage size (x3 smaller) and load time (x2 faster). Old cache files will be automatically overwritten by new cache files. * Replay Parser: Fixed some bugs. * You can now use items in the inventory by left-clicking on them (for example to change Power Treads attribute bonus). Item cooldown (if there is) is not supported though. * Replay Parser: Implemented map cache system (Options->Cache maps). This should greatly reduce the replay parse time. Enabled by default. * Replay Parser: If the map path provided in the replay does not exist, the default folder is used (Maps\Download) if the map exists there. * Replay Parser: Fixed error that prevented replays to be parsed when no map is loaded (replay map not found). * Replay Parser: Apm now starts counting after hero pick (the result was lower in -cm). * Replay Parser: Fixed a bug in BBCode Settings form that caused a critical error in some cases. * Replay Parser: BBCode Settings form now properly saves the last entered value. * Replay Parser now remembers maximized/minimized window state. * Fixed some conditions under which Replay Parser export should display picks. * Fixed some bugs in Replay Parser that caused parse errors. * Fixed Auto-Updater from running each time you run the tool instead of as specified in settings. 1. 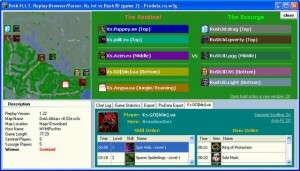 You need to have Warcraft III installed on your pc. This is because my program uses it’s datafiles. War3 installation path is determined through registry, so you don’t have to specify it manually. If War3 is not installed, then my program wouldn’t be able to load maps correctly. 2. Since my program is written in C#, you need to have .NET Framework 2.0 installed on your computer (see link below). Tell me if my program does not run after installing this version of framework. Btw, some programs install FW2.0 automatically in order for them to work, so you might already have it installed on your pc. This the old location of DotaHIT source files, when I developed it with another programmer. That didnt work out, so I moved to SourceForge now. Still there might be some experimental versions on dotaht.googlecode and you can post your suggestions, report bugs, etc. in the “Issues” tab of the project page. Note: if you want to download the source code from the project page, switch to “Source” tab and use the url you see (“…/svn/trunk/”) with some “SVN tool” (search for this in google) which will automatically download every source file found. This is a sample project of a plugin for DotaHIT Replay Parser. It does almost the same things as the default replay export (hero bbcode and name), but now you can easily modify the source code so that it will display information as you want it without studying the full source code of DotaHIT. DotaHIT plugins have almost full access to DotaHIT’s core variables so you can extract any data you want from the replay (lanes, chatlog, killog, apm, creepstats, etc.). * 1. You can suggest any feature you want. Even the most boring ones that I would never consider otherwise . As long as it doesnt screw up DotaHIT intereface, does not conflict with its other features, and is in the “spirit” of DotaHIT , its fine. * 2. The average price for a feature will be smth like 30$. If the feature is too small and easy to code then try to suggest more features so that overall they will be worth the 30$ price. Its just that I’m lazy to code small feature for 5$, but coding six small features for 30$ total is fine. If the feature is very useful and needed for DotaHIT (only i will decide that ofc ) then i will do it for free (because I should probably have enough motivation w/o money). * 3. Paid features can be discussed via my ICQ:194582102 (or via PM on this forum if you have troubles with that). Btw my timezone is GMT+2 and I’m usually online from 12:00 AM – 11:00 PM. I will tell you how much time will it take me to implement this feature and how much will it cost (~30$ imo for one big feature or a pack of small features). Then after all is settled, you pay me first, then i do the work (i dont know if i can trust ya ). * 5. I can only use WebMoney service for online payment in my country, so make sure you have an account there. * 6. It is possible to pay half of the price (or w/e you can) and then waiting for someone else to pay the rest. I will then make a TO-DO list of features waiting to be fully payed, so other people will decide if they want to support specific feature development. When the feature will be fully payed I’ll start working. Though you risk at ending up w/o money (don’t forget about commission fee for transfering money back in online payment services) and feature if noone else would support it enough.